Pretty short track but fun, ends up on a nice quiet beach, don\'t attempt the track though if you don\'t have good ground clearance. Make sure you let someone know your going down there, its a long walk (or swim) out if you get stuck. One way in, one way out. After years of errosion with no maintenance, this track can not be successfully transversed without at least 30cm ground clearance, low range use and some hill climbing experience. There is serious ruts and boulders just waiting to crack your sump or diff. 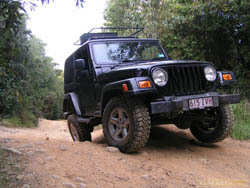 You would be a fool to attempt it without either a winch or another vehicle for tow-outs. Hey guys, had a crack at the track today in the HiLux & it is still a fairly rough track! Not to be attempted without a bit of lift, decent AT\'s or MT\'s & some sill & underbody protection! I hit it solo but wouldn\'t have done so without the trusty winch as back-up - no luck in getting stuck though so it stayed put in the front bar :).